Glide through the most secure corporate computer networks. Crack the ICE that stands between you and that big score. Drop your cyberlinked autoshotgun to the floor empty. Flick chrome blades from your fingers. Dive into the midst of that corporate response team to secure your team’s exit. Turn up your synth-leather jacket against the rain. Watch the back-alley entrance of the club for your target. Tail the armoured limo through the neon-bathed streets. Cut power to the alarms. Drop over the wall into the compound. Slip past the auto-sentries. Locate and secure the prototype. Escape under the eyes of the rotor-drones. Whatever your story, you are the extended assets of vast multinational corporations, operating in the criminal underground, and performing the tasks that those multinationals can’t do... or can’t be seen to do. You are deniable, professional and disposable. 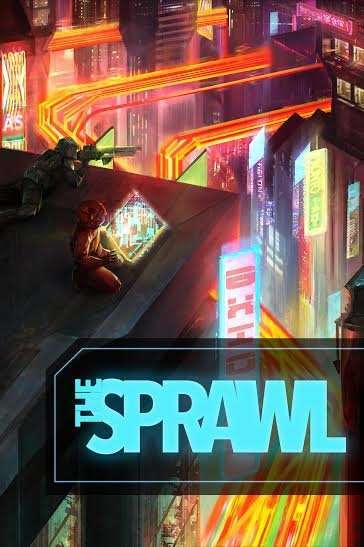 The Sprawl is a game of mission-based action in a gritty neon-and-chrome Cyberpunk future for an MC and 2-4 players. There are a thousand stories in The Sprawl. What's yours? Product includes three versions of the PDF (NOON, as shown in the preview; MIDNIGHT; and print-friendly black and white), printable playbooks, move sheets and MC play sheets. This is the NOON version of The Sprawl. Print on Demand copies feature black and coloured text on a white background. I need a quick clarification. There are different pages midnight and noon, but it also says "Product includes three versions of the PDF"
If you buy one PDF do you buy them all or are they separate? "The separate page for NOON is a workaround because DTRPG won't let you have different layout versions of a Print on Demand product on the same product page. Regardless of which you buy, you get all three PDFs, so if you just want the PDF, it doesn't matter which page you use." I wanted to start with saying that I'm a big fan of this system and have been itching to try it out with some friends. I'm an elementary ed teacher and I'm on summer break (yay I have time!). So back on June 14th I placed an order for the book. Evidently it got lost in the mail and they couldn't replace it until 30 days had passed. So around July 19th, I get confirmation it's going to the printer and ships on July 22nd. I still don't have my copy and it's August 3rd. Media mail is suppose to take 2 to 10 days. My summer break is essentially wrapping up at this point, and now there isn't time for me to run it at all. I'm just really frustrated. Did anyone else have this problem with shipping? I would get the pdf but I get pretty intense migraines if I look at a screen for too long (hence getting the book). If you have any advice for me I would appreciate it. The BW print version does not appear to work. I've tried a number of different PDF readers, all say the file is corrupted/unreadable. I've tried re-downloading it several times. The others work fine for me. Hello, I just purchased the game and a noon and midnight soft cover. I feel I should point out that when I downloaded the noon PDF is got the midnight version of the book instead. The PDF bundle that comes with every version includes three different PDFs: MIDNIGHT, NOON, and Print-Friendly B&W. If you don't have all three versions, something must have gone awry behind the scenes. Please get in touch via email (contact publisher above) so we can sort it out! I can confirm that after I ordered the physical noon version, the email notice said a midnight version was shipping; the noon actually showed up on my doorstep. Thanks for the confirmation, Omari! As far as I know, everyone has received the correct version. If you haven't please contact both DTRPG customer service and me. Thanks! Hi, guys! Amazing work. I would to know if there are character sheets in this PDF version, similar as those in Spirit of 77/Dungeon World, with all needed information to players about moves, gears, etc. Yes! As it says in the product description, the PDF includes three versions of the PDF (NOON, as shown in the preview; MIDNIGHT; and print-friendly black and white), printable playbooks, move sheets and MC play sheets. Those few list items are the sheets you want. If (for some reason) you get a print copy without the PDF, you can find those sheets on the ardens.org website. Are there Letter sized playbooks? They currently appear to be Legal. Am I supposed to Tri-fold them? Thanks for your answer. Silly me for not looking/reading properly all of the description. Keep up with the amazing work. Be careful. I ordered this version and just received notification that the midnight version was being sent. DO NOT BUY. I will update when my issue is resolved. Someone else reported this on G+ last week. I think it's just a labelling mistake, but please contact DTRPG customer support and let them know this is potentially a problem with your order. If you contact me through the "contact publisher" link above, I can approach them at my end as well. I had the same thing. The book haven't arrived yet, so we'll see. Have your books arrived David and Mikael? Other customers who reported this error did receive the correct books. If you didn't please contact me and DTRPG asap so we can sort it out! Can you add a preview of the Noon version, so we can see how both versions look? I'm not sure why they aren't showing up right now, but I'm working on it. In the meantime, the latest post on ardens.org has photos of a sample page of the different versions, which will give you a better idea than the simple description above. I'll get those previews back ASAP though. Both previews of the NOON version should now be working properly. This title was added to our catalog on July 01, 2016.